My favorite photographs are often the most serendipitous ones, the unexpected subjects that catch my eye and take me by surprise. I took a lot of photos in February, most of them outdoors: landscapes, seascapes, and snowy nature shots. Maybe that’s why this one stood out when I reviewed my photos for this month’s Scene & Story. One morning in early February, I got up at a ridiculous pre-dawn hour to meet a friend for breakfast. (I’m not much of a pre-dawn sort of person, but she’s worth it.) Now, my apartment’s windows all face west. Therefore, I never get morning sun in my home, and it was still dark as I got out of bed and quickly got ready to go. The sky was brightening by the time I came downstairs, but the living room was still dim and shadowy. Imagine my surprise when I turned toward the door to leave and discovered this beautiful golden light and shadow there. It must be some kind of magic! In reality, I quickly realized it was just ordinary…what?…physics, I guess. The rising sun was striking the windows of a building across the river, and the angle was just right for the light to reflect into my west-facing windows and shine all the way across the room to illuminate the door on the opposite wall. But you know what? I’ve never seen it before in the two and a half years I’ve lived here. There are probably only a couple of days a year when everything lines up perfectly, and I just happened to be there at that exact moment. It felt like a gift, and I left the house with a smile on my face and a skip in my step. Serendipity. That’s magic enough for me. Categories: Scene & Story | Tags: light, magic, reflection, serendipity, shadow, sunrise | Permalink. I have two Be Still lessons to post today. 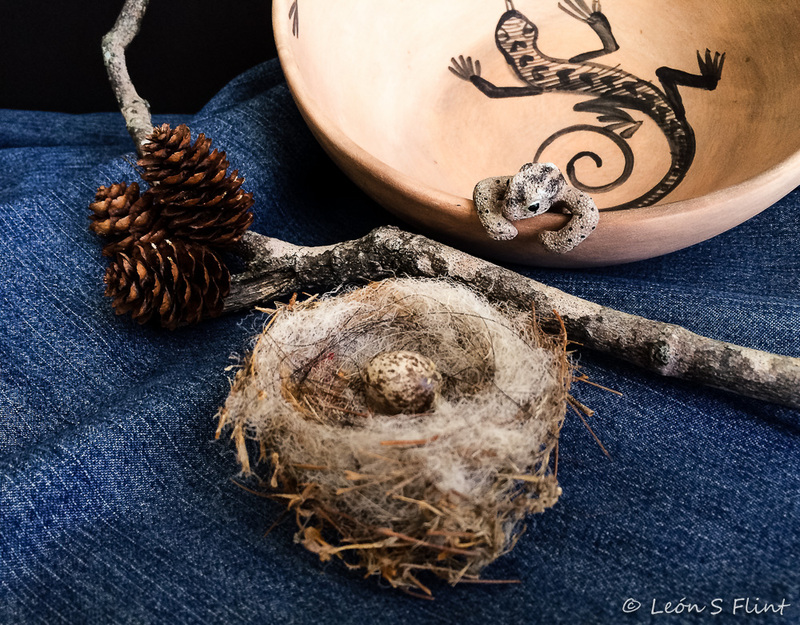 The first, from last week’s assignment, is a still life with organic elements, photographed with side light. Kim’s examples for this lesson were dark and moody, so I headed in that direction, too. I used one basic setup for these, varying the cropping but mostly just experimenting with some Lightroom presets in post processing. Processed with Kim Klassen’s kk_organic, with decreased clarity and slightly increased saturation. 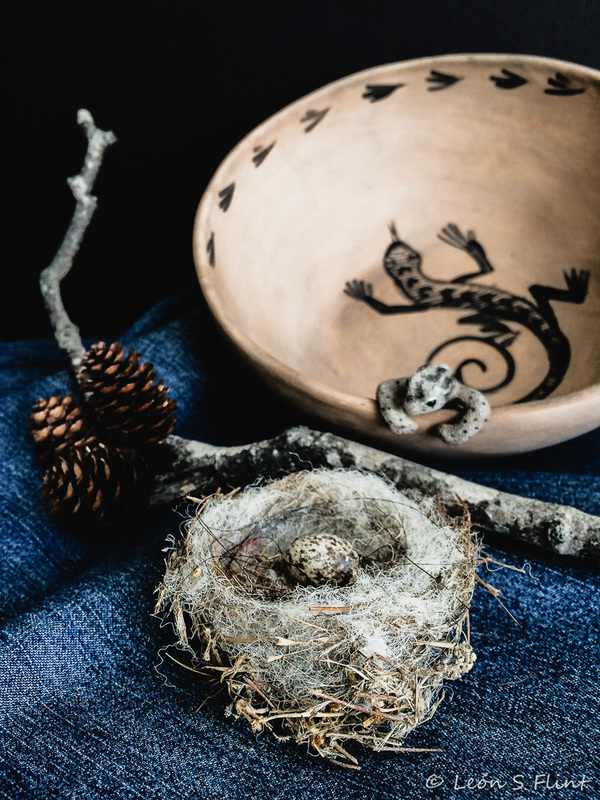 I bought this hand-painted bowl on a trip to the Grand Canyon about 20 years ago from a Native American man sitting on a blanket at the side of the road, selling pottery that he told me he made himself. It is stained with smoke inside and out and looks like it was fired in a campfire! It reminds me of my roots in the Southwest, as well as of that rather magical trip. Processed with David duChemin’s Toxic Warmth preset. 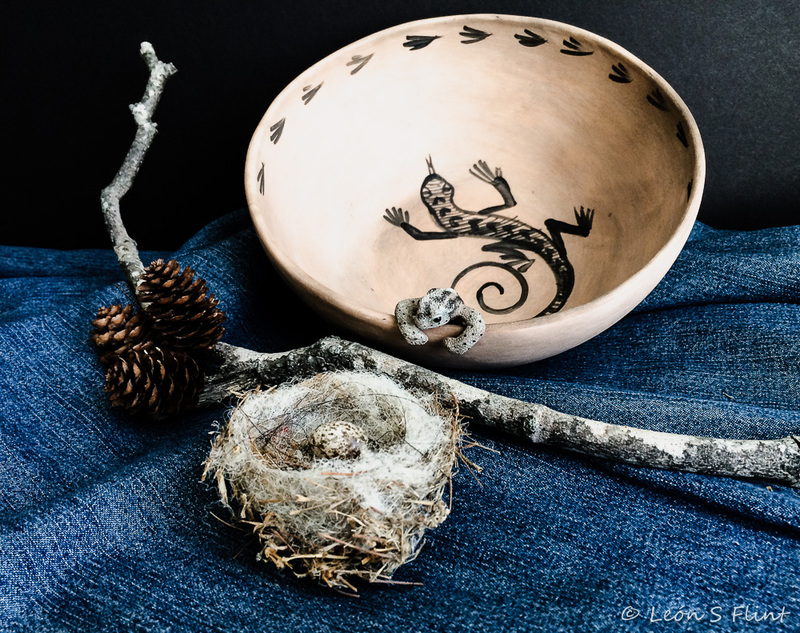 The little lizard crawling out of the bowl is one of those little critters that are meant to be hung on the rim of a flowerpot. I don’t remember where I got him, but I do remember that I bought him just because he looked so much like the lizard painted inside the bowl. It amuses me to think they might be related. I found the nest when I was living in California a couple of years ago. The egg, which is broken open on the side you can’t see, I picked up here in Maine. I have no idea what kind of bird made either one. The stick and cluster of cones came from two unrelated trees in my daughter’s yard. 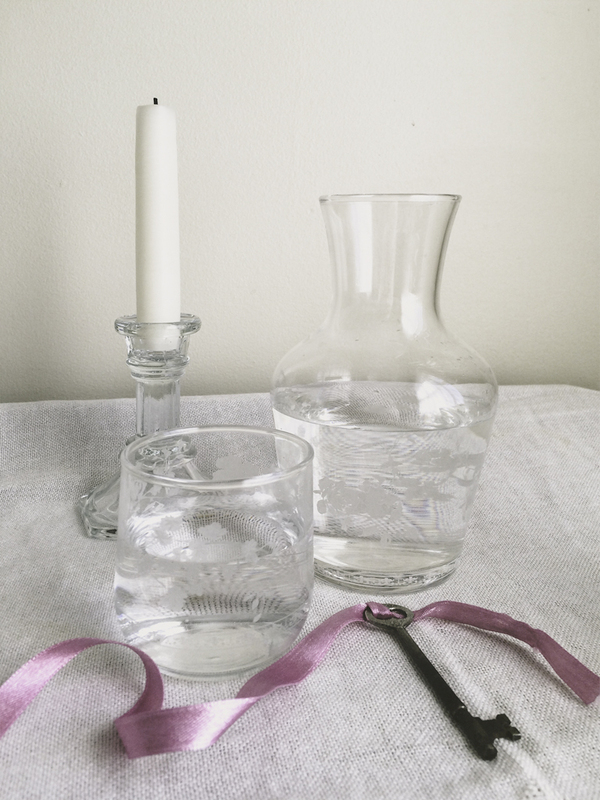 This week’s lesson is just the opposite: glass, light, bright, white, airy. For this one I tried several different arrangements. 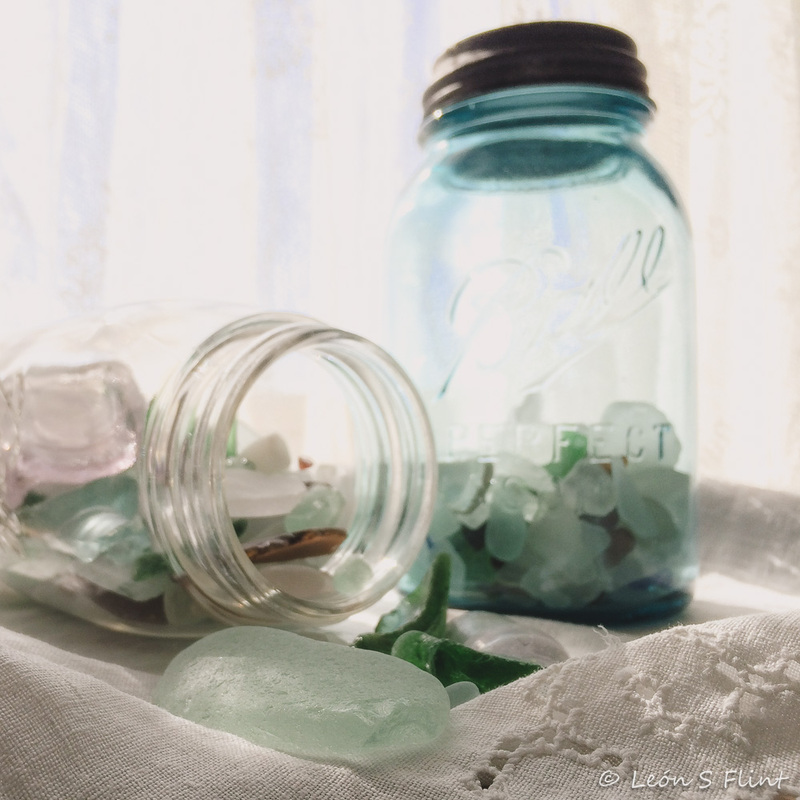 Vintage mason jars filled with sea glass, old linen napkin, backlit through lace curtains. Processed with kk_slightlight with clarity reduced quite a bit because I wanted that glow-y look. I’m afraid I can’t begin to tell you how I processed this one. I tried so many variations, including starting over several times, that I completely lost track. I’m not thrilled with it, but it’s a whole lot better than what I started out with! This is as it came out of the camera, plus Kim’s kk_touchof-1 texture. I like the soft, natural look of this one. Here it is with with the same texture, processed with Kim’s kk_slightlight preset. It’s more dramatic and I like it, too. It’s so hard to make decisions about these things. And that’s me caught up again and looking forward to the weekend! I hope you all have a good one. Categories: Be Still - 52 | Tags: candle, carafe, dark, egg, glass, key, light, lizard, mason jar, nest, pottery, sea glass, vintage | Permalink. This month’s Photo-Heart Connection contains a tiny touch of Photo-Heartbreak. And a very large amount of gratitude. I’ve had the privilege of living in this beautiful, historic home since last November. Now it has been sold, and in a couple of weeks I will be moving to an apartment. I’m looking forward to getting settled there, in what I hope and expect will be my long-term home. I’m tired of moving. What I had not expected was that I would be so sad to leave this house. It is large, simple, gracious, and elegant. It’s over two hundred years old, with slanted floors, crooked doors, and wavy windows. And the most beautiful light, threading its way into and through every room. It has a warm, welcoming spirit, a “presence” of its own. It’s altogether the loveliest place I’ve ever occupied. I moved in here knowing it was only temporary. I unpacked everything anyway. Yesterday my friend Susan asked if I was sorry I did that. That’s an easy one: No! I moved in completely, bag and baggage, and apparently heart and soul, too. And I don’t regret it for a minute. Living here fully, not just camping out, has been a wonderful experience, and one I’ll always treasure and be thankful for. 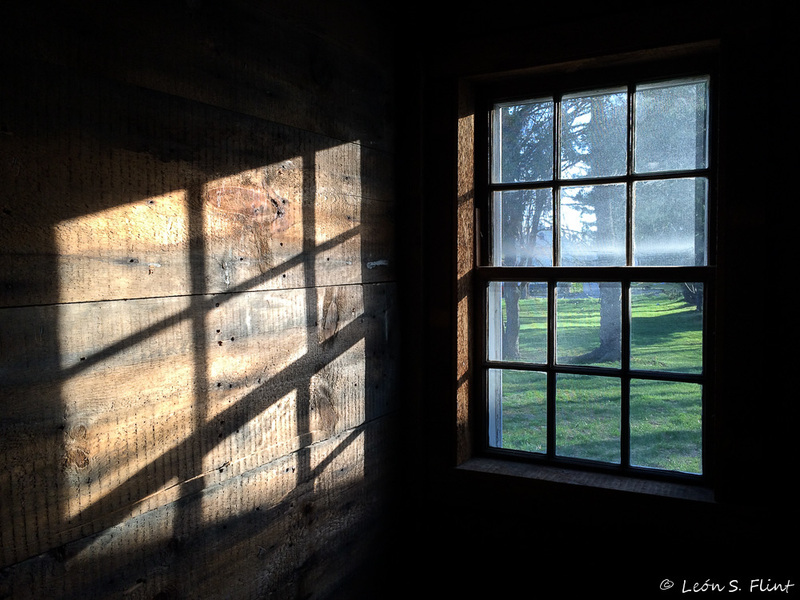 The photo above was taken late one afternoon as the sun shone through an old window onto the rough-sawn boards of the mudroom wall. 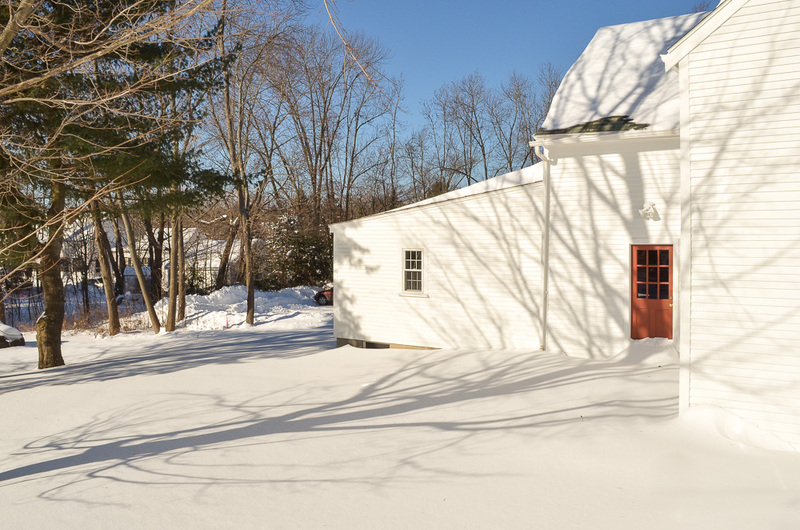 It will be the perfect reminder of the winter and spring of light (and delight) that I spent in this old house. I don’t know the meaning of the song (I don’t think it’s religious), but every time I think of this image, the tune and words start running through my head. It feels right, somehow. 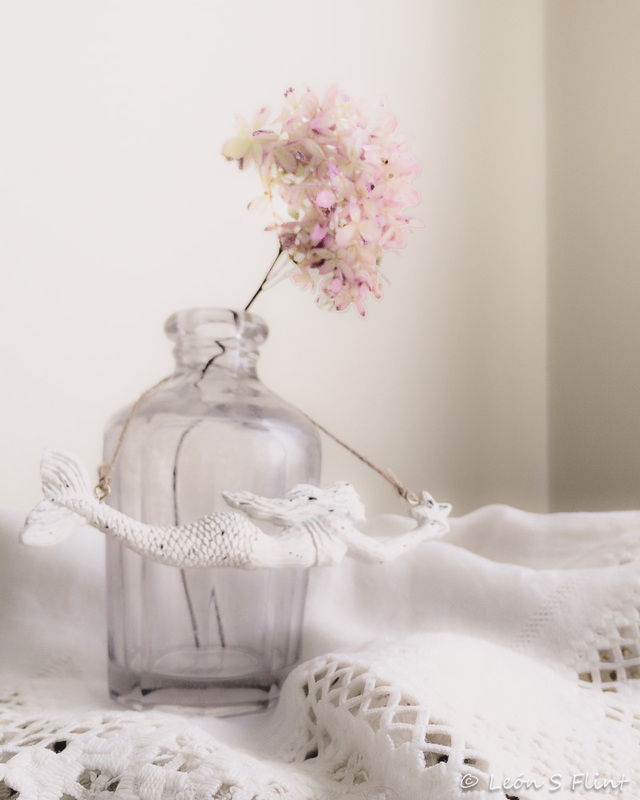 Linking with Kat Sloma’s Photo-Heart Connection for May. 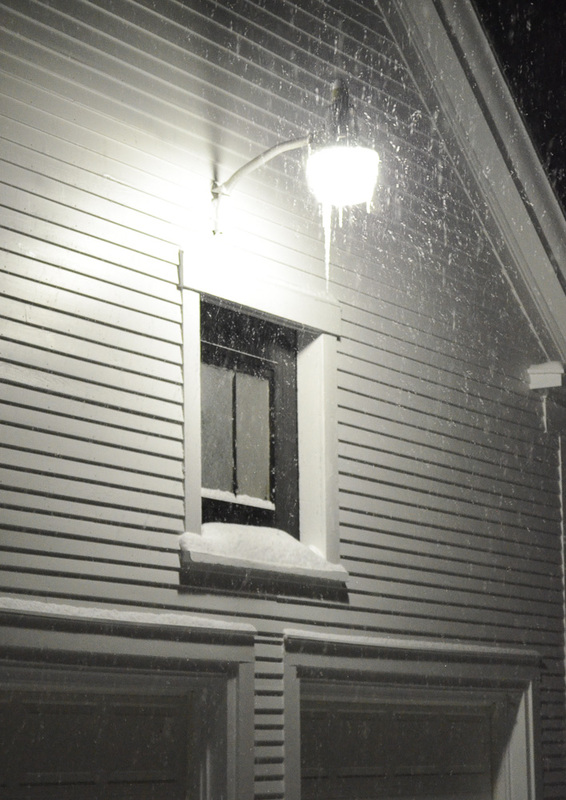 Categories: Home, Photo-Heart Connection | Tags: home, light, moving, old house | Permalink. Hard to believe it’s only three days til Christmas. My holidays are usually small and quiet and I’m feeling ready now. 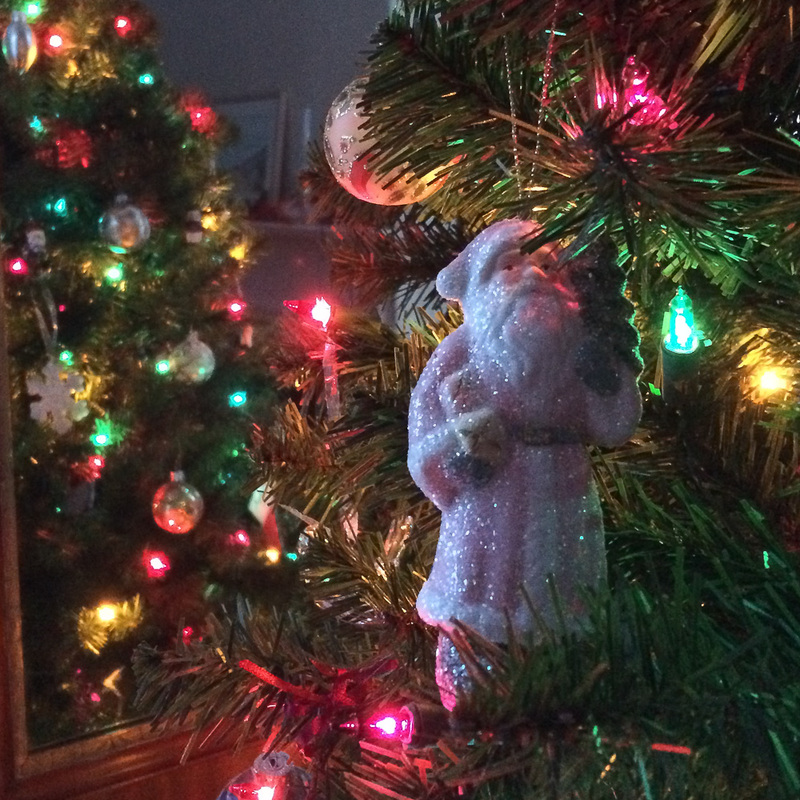 The decorations — not many, but enough — are up. Gifts have been wrapped and placed under the tree or mailed to far-off places. I’ve enjoyed shopping with my daughter, and getting together with friends for a meal or a movie or just a cup of tea and a chat. On Christmas morning presents will be opened in front of the fire, in pajamas, accompanied by carols on the stereo. Meanwhile, there’s still time for Scavenger Hunt Sunday! This week’s list includes: Lights, Tree, Big, Makes You Feel Merry, and On the Door. Let’s see what we can find. It would not be my choice to leave this light on all night, but the other tenants and the landlord like the security it provides. We had more snow Tuesday night, and the warmth of the bulb caused the falling flakes to melt and icicles to form on the cover. 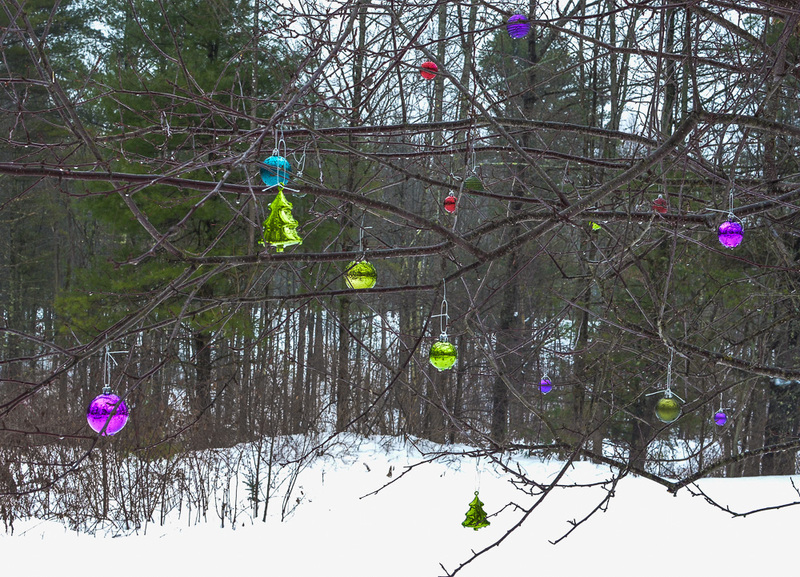 A friend hung these ornaments on the bare branches of a small tree in her front yard. I loved the unexpected color against the wintery woods on a cold, drippy morning. Big house, big yard, big snow (another 10 inches), big blue sky, big trees and a big shadow. Waking up to fresh, fluffy snow and seeing that the squirrels have already plowed their way between the trees and the house made me laugh. The one you see climbing the trunk had just jumped from the roof into the snow, disappearing completely for a second or two before digging his way out and rejoining the main “road.” You can see where he landed and came up again in the foreground of this photo. The interesting thing is that they NEVER jump off the roof onto the bare ground. 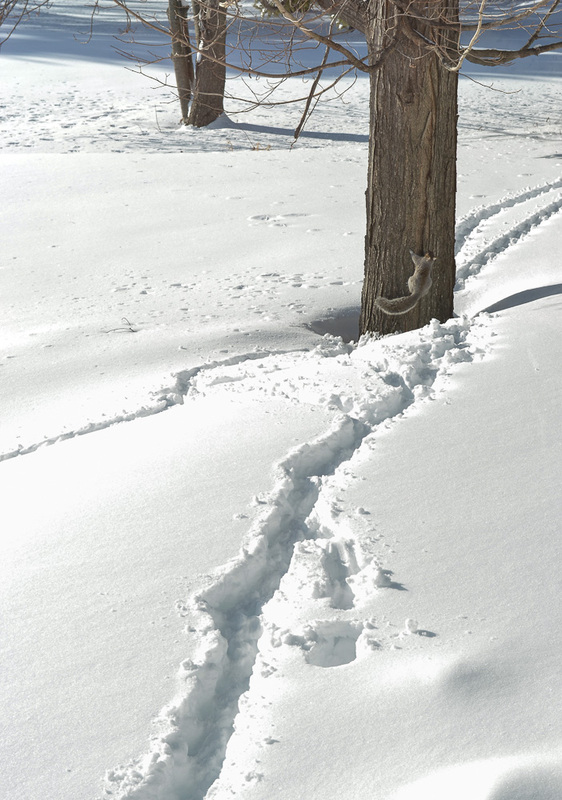 How do you suppose they know it’s okay to do it into the soft snow? I love the squirrels and birds and all the wonders and mysteries of nature that surround me wherever I am. They make my heart merry in every season of the year. 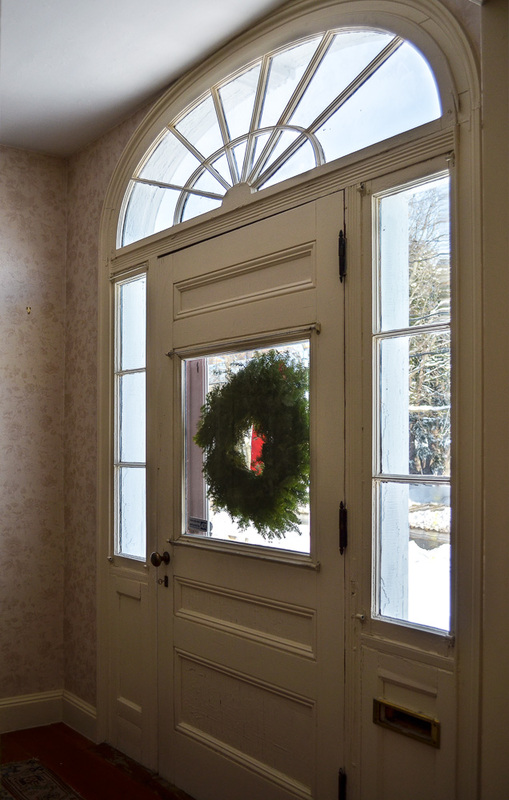 On the front door is a simple balsam wreath adorned with a red velvet bow. In typical Maine fashion, only the mailman and strangers ever come to the front door. Rather a shame, really, because it’s such an elegant entry. On the Door – well . . . Santa won’t have to knock on the door, cuz I have a chimney for him to come down. Check? Wishing those of you who celebrate Christmas a happy and blessed one, and to all a happy Winter Solstice. For those of us in the northern hemisphere, that’s something to rejoice about! Come check out this week’s linkup at Ramblings & Photos. Categories: Holidays, Scavenger Hunt | Tags: Christmas, decorations, light, Maine, Santa, snow, squirrel, tree | Permalink. This photograph is a mystery to me. 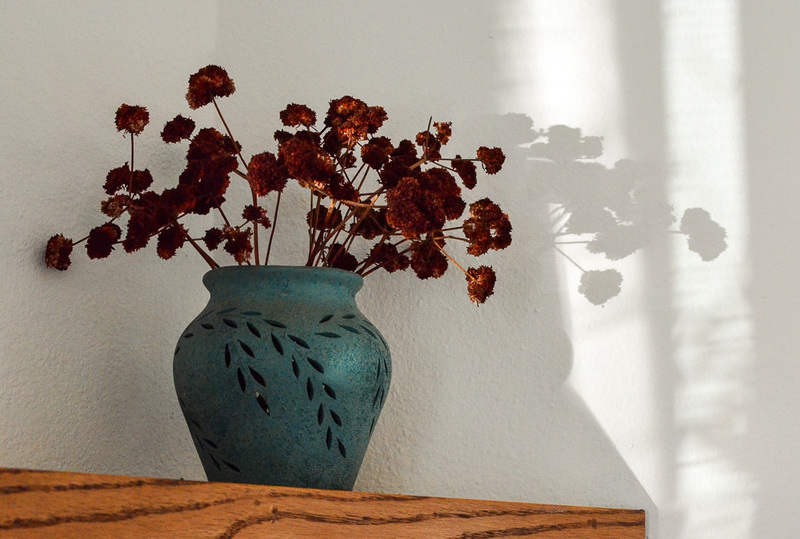 I walked into my living room one afternoon and was immediately attracted by this shadow on the wall. I picked up my camera and took three shots of it, then went on about my business. It wasn’t until I reviewed the images that the mystery occurred to me. This pottery jar of dried California buckwheat has been sitting in this spot on my mantel since fall. My fireplace spans a corner of the living room and is the one spot in the room that receives no direct light at all. Ever. The only explanation I can think of is that the afternoon sun must have bounced off my car in the driveway and reflected through the window and into the corner. But I’ve never seen it before or since, and when I peer through the window from the outside, I can’t even see the mantel. So there you go. There is a perfectly rational explanation — probably. But the point is that I don’t need an explanation. I like the mystery of it. This photo reminds me that there are things in this world that don’t have easy or pat explanations. There are many things I don’t understand or have the answers to. That’s okay. I don’t need to have all the answers. I just want to be ready to catch the light when it comes. Linking with Kat Sloma’s Photo-Heart Connection, a monthly practice of journaling about the one photograph I’ve taken during the month that speaks most strongly to my heart. Categories: Photo-Heart Connection | Tags: California Buckwheat, light, mystery of life, photography, shadow | Permalink.